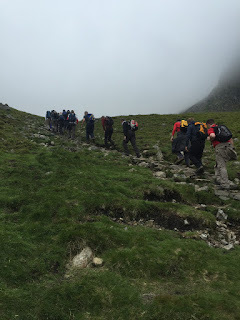 Outdoor Courses for Scrambling, Climbing, Kayaking & Mountain Activities: Kendal Mountaineering Services - where have we been & what have we been up to in June and July 2015?? Kendal Mountaineering Services - where have we been & what have we been up to in June and July 2015?? Its ages since we've posted anything up on our blog. Not because things haven't been happening, no - in actual fact, mid June was so busy Iain didn't have time to post; and then he went away to Spain for a week - unthinkable at this busy time of year - but true. Anyway, here is a quick rundown of what we did work-wise before we went away! Photo one sees a team from Kellogg's UK paddling a Canadian Canoe Raft on Grasmere on Wednesday 17th June. This was part of a Team Building afternoon on the lake and the group played all sorts of games. You can read a further report about the session here. Canadian Canoeing is a great way to explore any of the Lake Districts Lakes and our prices start at just £45 per person for a four hours session with all equipment included. An ideal sport for families visiting The Lake District during the Summer Holidays. The following Saturday, Iain was out with returning client Adam Mitcheson who was after some Alpine Ropework Skills Training. Iain took Adam to The Bell - a fine little scrambling route in the Coniston area. Here, we looked at the skills required for alpine scrambling and also for arranging an abseil descent. Both techniques are necessary on undulating Alpine ridges as Iain would rediscover some three weeks later. We also looked at the techniques required for ascending a fixed rope such as the ones likely to be found on Adam's planned ascent route of Mont Blanc via the Aiguille Du Gouter and we finished off by looking at arranging a hoist to rescue someone who has fallen into a crevasse (photo two). Iain intends to contact Adam to find out how his Mont Blanc trip went as we understand that the Gouter Route was shut by the Gendarmerie due to continuous rockfall down the Grand Couloir recently. Anyway, we hope our day of skills training was beneficial for his trip to The Alps. Read more about this day here. The very next day, Iain was running an Introductory Kayaking Session for Stella Tucker, her daughter Jen; and Jen's bloke Dave. This session had been arranged as a birthday present for Stella during one of the family's many visits to the area. We met at Waterhead and after some skills training, paddled across the head of Windermere to where the combined flow of the Rivers Brathay & Rothay enter the lake. We travelled up here (photo three) and visited both rivers paddling as far upstream as the depth of water would allow before returning to the lake and paddling across to to Pull Wyke Bay and then heading back to Waterhead. The three thoroughly enjoyed their Introductory Kayaking Session in The Lake District - and you can too for only £45 per person for a four hour session. Kayaking is a great way to explore the Lake District's lakes during the Summer Holidays. Two days later, Iain was briefly out Scrambling on Piked How in Langdale with Paul Deakin and his partner. Unfortunately, we didn't get very far before Paul's partner stated she didn't feel well and felt unable to continue. Hopefully the pair will return at another time so that we can give them the benefit of this fantastic scrambling route all the way from the floor of the Langdale Valley all the way to the summit of Harrison Stickle. You can read about about a previous trip to this route here if you are interested in trying a Guided Scrambling Day in The Lake District with us. At the same time as Iain was out with Paul Deakin & partner, one of our associate instructors ran a one day bespoke Navigation Skills Training Course in The Lake district for Janet Holleron in the Kentmere Area of The Lake District. 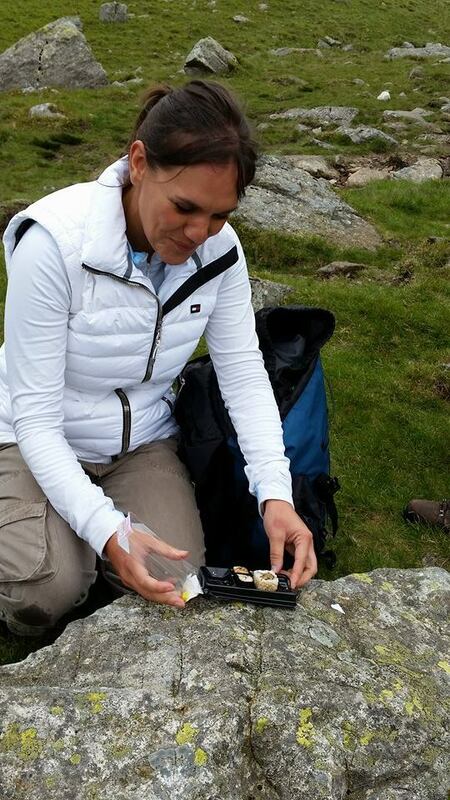 We are not sure what happened as Hayley only managed to get one photo and that was of Janet enjoying her Sushi somewhere during the day out; although we understand that Janet found the day thoroughly beneficial. We offer you two types of Navigation Skills Training Courses in The Lake District - our superb value weekend courses are listed here and cost only £80 per person for a two day course or, like Janet, you can book our Bespoke Navigation Skills Training Course at only £160 per day for up to four persons. Both of these courses are ideal for anyone wishing to improve their map reading a navigational abilities! Finally, on the day that we left for Spain, we had four instructors working on our behalf with a group from Marston's PLC . 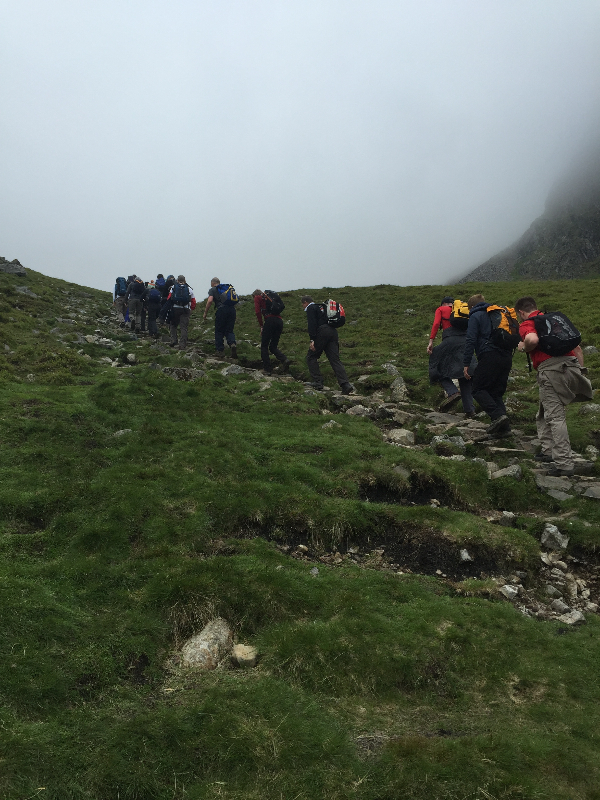 This event was arranged for Marstons who were raising money for charity and had asked us to quote for guiding a group of up to thirty five persons up Scafell Pike to the summit and back down again. There are a number of ways to ascend England's highest mountain and the shortest way is to ascend via Lingmell Gill and Hollow Stones directly to the summit. This route is also the steepest way to ascend Scafell Pike. One of our instructors on the day took this photo of the group ascending Brown Tongue en route to Hollow Stones and the summit. As can be seen, it was a cloudy day although dry and the group made good time. 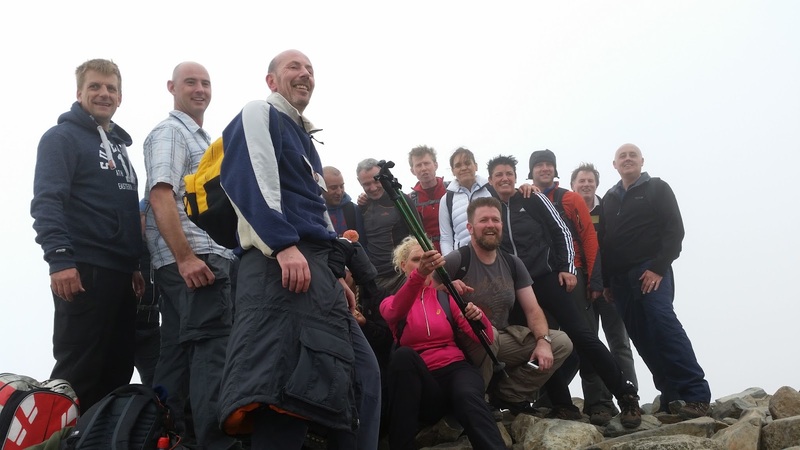 The final photo from this report about guided Hill Walking Session in The Lake District sees a satisfied group of Marston's employees arranged together at the summit of Scafell Pike. In the end, only 25 out of the 25 employees originally booked on to this guided fell walk turned up meaning that with our team of four instructors holding a minimum of the Summer Mountain Walking Leader Certificate, the party was well catered for. All instructors that we use on any of our guided Hill Walking Days in The Lake District will hold the Summer Mountain Walking Leader's Award or higher, will be first aid qualified and will have emergency equipment with them. Ideally, they will also know the route that you wish to walk as well. Prices for guided Hill Walking in The Lake District start at just £160 for a group of up to four persons or £40 each. If your group is larger then contact us for details of the price per person which will be less the larger your group size. For example, Marston's PLC paid just £20 per person to be guided up & down Scafell Pike by our team of instructors. If you have enjoyed reading this post about the many activities and Skills Training Courses that Kendal Mountaineering Services have to offer you and would like to enquire; or make a booking - then contact us via the website here, call us on 01539 737332 or ring Iain on 07761 483364.